Happy belated 4th of July. Hope everyone had a safe and fun long holiday weekend. We certainly did. Some BBQ, playing in water and a last minute dash to a parking lot with 2 nearly sleeping kids to see some fireworks. Add a few stomach viruses and a broken dishwasher and that about sums up our weekend. Oh well, at least it's Monday, right? This monday is the first ever ScrapTiffany challenge. 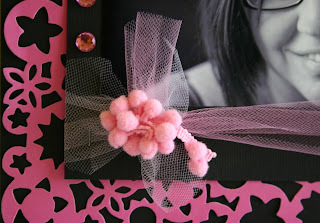 The challenge is to scrap a layout about YOURSELF and use primarily pink and black. Here is a little sneak of my layout. Go on over there to see the rest and the other designers' fabulous takes on this challenge. OH, and if you take the challenge yourself, be sure to send a photo or scan HERE and you will be entered into the monthly drawing for a free ScrapTiffany kit! Today was also the start date of Jessica Sprague's free class Photo Editing: Frame Ups and Special Effects. The first assignment was to use a transparent frame and word art on a photo. Here is mine. I love to play around with the digital stuff, but it is really nice to have someone walk you through it and Jessica's lessons are very clear and easy to follow. Well, other than that we are just trying to stay cool. It was up around 111 today and promises to get to the 115 range by saturday so we are looking for fun indoor activities. Here are a few things that we did inside this weekend.